1. Bake eggplant in oven 1 hr at 400 degrees. Turn once in a while. 2. Let cool. Peel off skin, and mash with hands. 3. Chop 3/4 red onion, 1.5 Roma tomatoes, some ginger, 1 red bell pepper (not shown because I forgot). 4. On medium heat, add bay leaf, 1 dried red chili, 1 baby spoon mustard seed. It should get bubbly. 5. Add ginger and tomatoes, saute until it becomes a lumpy paste. 5. Add onions, bell peppers, turmeric, salt and saute. 6. 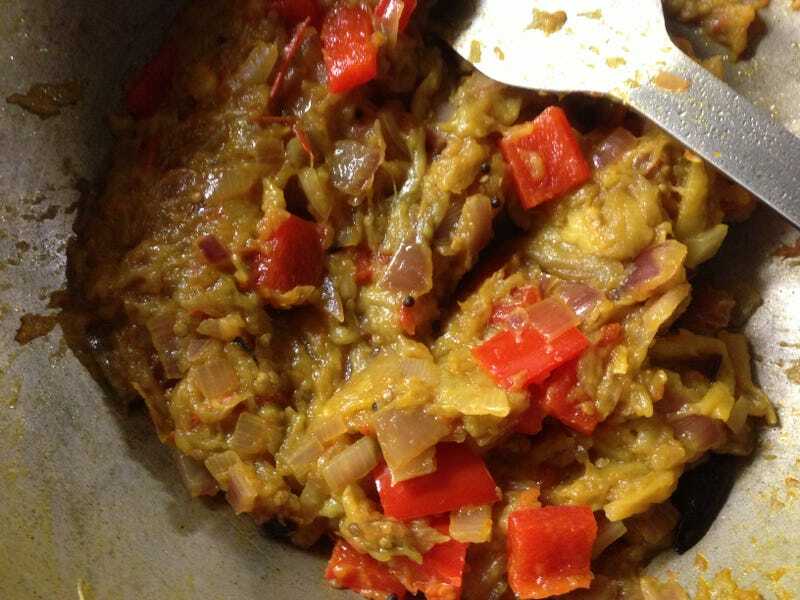 Fold in eggplant, add a little more turmeric and some ground cumin maybe, and maybe a little salt? 7. ALL DONE. Maybe top with cilantro tomorrow. bake eggplant and mash. mix in chopped red onions. top with coriander, and serve with rice and lime juice/salt.